Retirement is not in my vocabulary. They aren’t going to get rid of me that way. In working with iOme Challenge, a national think-tank on raising awareness about financial security in retirement for millennials, I have heard people use the old adage “a penny saved is a penny earned” when encouraging people to save for their future. This saying is cliché indeed, but has become so because it is true. Most of us know that saving money is a good thing. It is also necessary. At the same time, however, I am sure you also realize how difficult it is to save money. Between your housing expenses, food, clothing, phone, internet, car, entertainment, student loans, and credit card debt, you are stretched thin. In fact, you are probably likely to have nothing left to save or are getting yourself into debt regularly, are borrowing money, or have someone bail you out. According to a recent study by iOme Challenge, 23% of us born between 1982 and 2000 have our parents or someone else helping us pay our monthly bills. As difficult as it is to save, it is also difficult to find simple and straightforward advice on how to start saving. In this article, I offer a few practical and simple tips to get you started. For more detailed strategies, however, check out my book: Own It: A Practical Guide to Defying the Odds and Claiming Your Life and take charge of your life: your purpose, your education, your career, your relationship, and your money. Late M. Scott Peck, famous psychiatrist and best-selling author of The Road Less Traveled, asked his patients a question: how do you eat your cake? Do you go right away for the icing, do you eat the cake part first, or do you have a measured approach? When he observed one of his clients going right for the icing, he understood that she had a challenge with delaying gratification. Saving, especially when it comes to saving for retirement, has everything to do with habits and with delaying gratification. Why would I wait 30 or 40 years to enjoy my life? YOLO: You Live Only Once, so spend it all now, right? When we are 20, this totally makes sense, because we tell ourselves that we can just save later. However, if you look at the facts, you know that saving makes a lot more sense when we start early. The momentary satisfaction is fleeting; stability in the long-term is a lot more rewarding and it lasts longer. So make it easy on yourself and start now. Make it easy. Automate your savings by signing up for a retirement plan through your employer or by consulting a financial advisor, or even by going online and enrolling into an IRA plan with a financial institution. Something. Anything. Then, set up automatic withdrawals from your bank account into your savings account, so that you don’t have to even think about it. Intentionally delay gratification by rewarding yourself. In other words, train yourself to not spend money on impulse by planning a particular purchase, anticipating it, and after you reach a particular savings goal, rewarding yourself with it. For example, if your goal was to save $500 at the end of the month, and you reached the goal, go ahead and treat yourself to something that is perhaps 10% of that saving. In other words, you are delaying gratification in exchange for something. I use this logic when working out: I love to drink protein shakes that come after a workout. So, if I am in the mood for one, I first have to work out to get it! Use a budget. I know, sounds scary, but we discussed it earlier. It is a necessary evil. Even if you made millions of dollars, you’d still need it. So, if you want financial success, stop avoiding it and use the power of your will to get into budgeting. It is not that difficult and you will get used to it, I promise. Another way to get into a habit of saving is by putting a little money here and there on the side, in a separate savings account that is hard to access. For example, this year, I have been doing the 52-week challenge, where I put the amount of money in an envelope that corresponds to a particular week of the year. For example, on January 1, I put $1 away. On the 30th week, I put $30 away. By the end of the year, I am supposed to have $1,378 saved up! One thing I noticed about this exercise is that it gets tough when I get into the latter weeks, so next year, I plan on doing it in reverse: on Jan 1, I will put $52 away. Saving doesn’t have to be so scary.You can even teach yourself delayed gratification by actually paying attention to how you eat your cake or your meals: do you leave the best for the last? Or perhaps you think that saving $15 would not make a difference. Or that you will save some day, but can’t do it just yet. Or, even worse, that you will become a millionaire so you won’t need to save. I agree with all these things. Here’s the problem: unless we save today, we are going to have a major problem in the future. I am not kidding you. I can overwhelm you with all the statistics that show how critical it is that we save. For example, an average 55 year old in the United States has less than $10,000 in retirement savings today. Now, I am not trying to scare you, because I believe we will ultimately be fine; however, I am trying to encourage you to take control of your future. Author Bio: Adi Redzic is Executive Director of iOme Challenge, an organization dedicated to raising awareness about the impact of financial security in retirement on future social and economic well-being of our society He is also a personal coach, author, and a motivational speaker based in Chicago. For strategies on making 2015 your best year yet, check out Adi’s new book Own It: A Practical Guide to Defying the Odds and Claiming Your Life or sign up for his weekly blog. You can follow him @thinkchange. 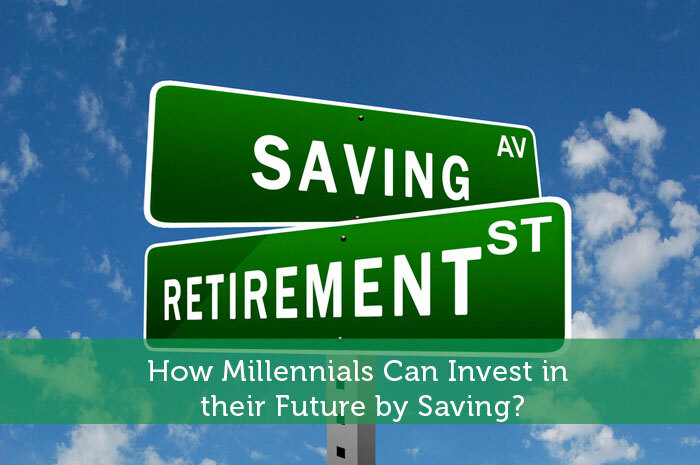 How Millennials Can Invest in their Future by Saving? We don’t have too many investing opportunities in my country (or at last I don’t trust them too much), so saving is our only option right now. It’s of course harder, but it can be done. I’m sorry to hear about limited investment opportunities in your country, but I am thrilled to hear “it can be done.” You are absolutely right and your “can-do” attitude is what will see you through! I’ve seen a lot about the 52 week savings challenge. Its an awesome idea to get people into the habit of saving slowly. No need to do it in reverse though, just keep increasing it in year two. See how high you can go! That’s a great idea — keep increasing it in year two and beyond. Love it! It can be really hard to save when you’re starting out your life as an adult. There are so many one time “start up” expenses. I’m on the older end of the millenial spectrum and I can say that my friends who started saving early are so much further ahead when it comes to net worths than those who put it off. I’m all about automating my savings. The less I have to think about my budget, the more likely I am to follow it. Seems counter-intuitive, but it works for me. By automatically transferring my paycheck to different savings accounts I only ever really “see” my money in the account I pay my bills from which automatically keeps me frugal. Do you think millennials should instead be focusing on “investing” for the long term rather than saving? Or are you simply using the term interchangeably? With a long term investment timeframe, I would focus on investing over saving in order to try to maximise returns by riding out volatility. Money saving is required of every homeowner. You can also use the help of a financial advisor, It helps to provide a good guideline. Make a perfect money plan according to a market strategy.